Back on the station, Sisko (Avery Brooks) receives word that the trail is simply a formality - O'Brien has already been found guilty of participating in a Maquis terrorist plot and will be summarily executed. 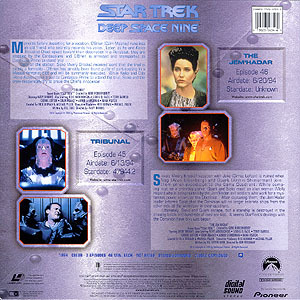 While Keiko and Odo (René Auberjonois) travel to Cardassia Prime to attend the trial, Sisko and the crew desperately try to prove the Chief's innocence! Sisko's (Avery Brooks) vacation with Jake (Cirroc Lofton) is ruined when Nog (Aron Eisenberg) and Quark (Armin Shimerman) join them on an expedition to the Gamma Quadrant. 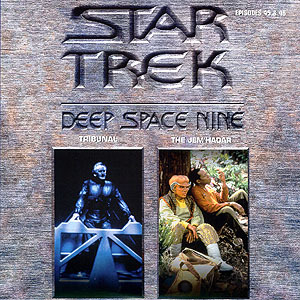 While camping out on a primitive planet, Quark and Sisko meet an alien woman (Molly Hagen) who is being hunted by the Jem'Hadar, evil soldiers who worm for a mysterious power known as the Dominion. After capturing them, the Jem'Hadar leader informs Sisko that the Dominion will no longer tolerate ships from the other side of the wormhole in their quadrant. Ultimately, Sisko and Quark escape, but a starship is destroyed in the ensuing battle and hundreds of lives are lost. It seems Starfleet's dealings with the Dominion have only just begun.